Competition from Malaysia? Real or not real? Whether real or not real, it is possible and soon we will face competition from Malaysia if the new government is doing the right things there. As reported in the news, there are some promising signs in term of meritocracy, transparency and democracy. And most importantly, they are not afraid to admit their past mistakes. 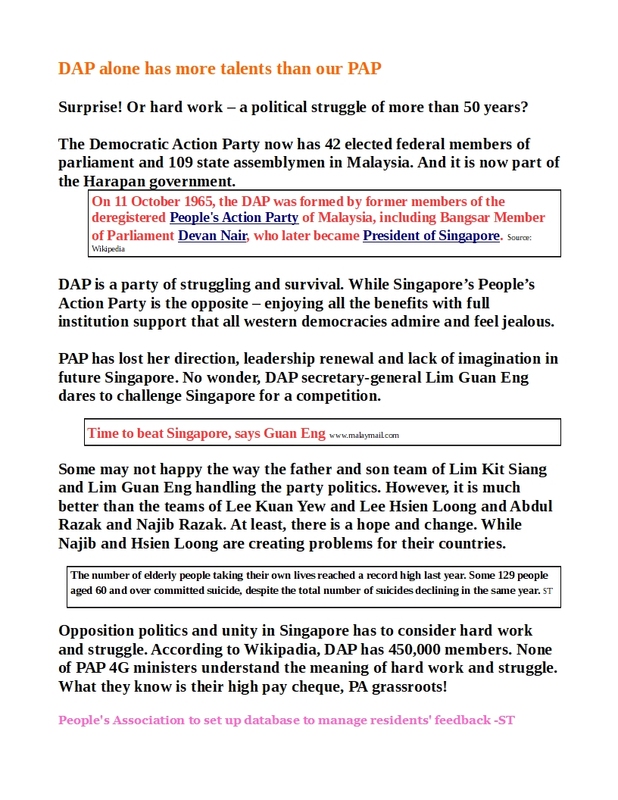 Real or not real, Singapore cannot take it lightly like the past 60 years. If the Penang experience can spread to the whole of Malaysia. 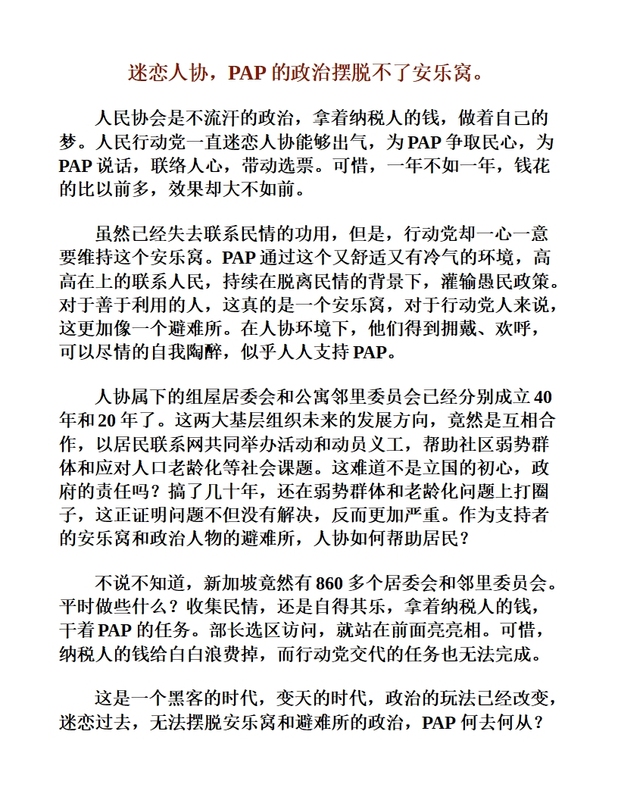 If Malays can appreciate and value the importance the third language - Chinese. And Malaysia can turn it as their edge over Singapore. If the government is more open and transparent than Singapore. Yes. it is a real challenge. If the leaders and GLCs executives are selected based on performance and meritocracy. Yes. They have started. If there are less political influences in business and commerce. Yes. They are trying. If Singapore only looks at the short-term issues like HSR, water, immigrations-checkpoints, etc, and fail to see the changes in Malaysia, by the time, we realise the real challenges and competition from Malaysia, it is too late. Based on the record of the past 60 years, the many “ifs” still remain “ifs” in Malaysia, there is no improvement and as Mahathir said the corruption situation has worsen and political appointed executives are all over the government and government-linked companies. And he intends to replace 20,000 of such appointments. 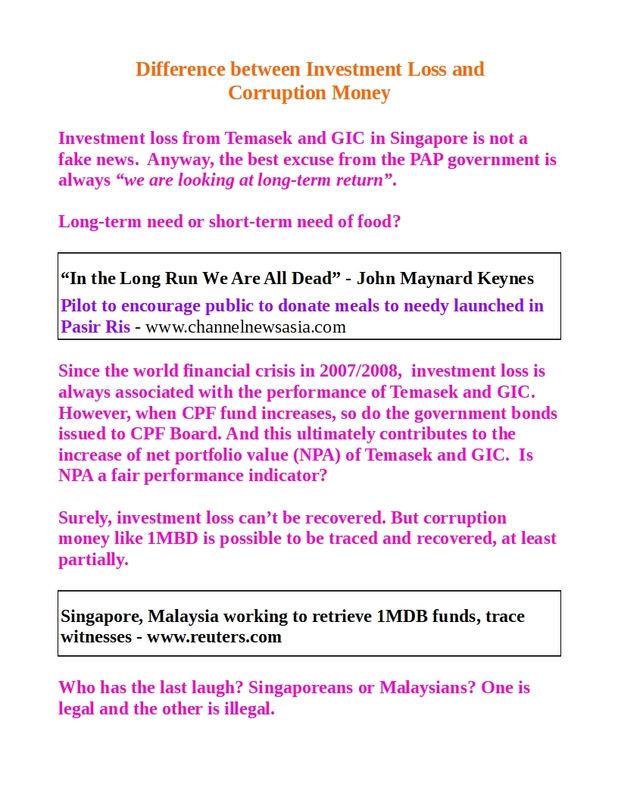 Looking back at our own situation in Singapore and our management teams of GLCs and associated so-called private enterprises, do we face the same problems as the new Mahathir government? Real or not real will see how we perform as compared to their Malaysian counterparts. The mindset of “we always win” may have to change as soon as possible. “We may lose”, perhaps, should be the new mindset. On the HSR issue, Mahathir said it is “not urgent” so do many other issues that involving Singapore and Malaysia. Mahathir has chosen Indonesia as the first Asean country as his official visit despite PM Lee Hsien Loong making an urgent visit there. Is “not urgent” real or not real? Why is Mahathir making such a statement? Some argue he is using water issue to delay or bargain for the HSR issue. It is an over simplistic explanation. If PM Lee is also thinking the same way, he has not seen the real competition from Malaysia. So what are the competition from Malaysia? If they only manage to solve half of the “if” factors and problems, do they still pose a challenge to us? Then we may have to look at the citizen engagement. Mahathir said his government will fall if there is no trust from the people. 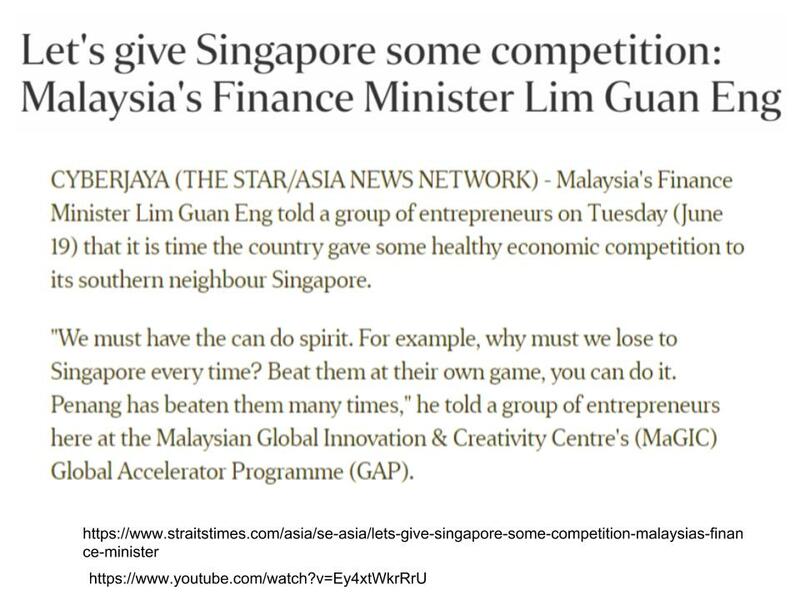 While, PM Lee is asking for your trust - he wants Singaporeans to trust him but on what ground?